Plot: Starting a war between Cyprus and Greece through biological terrorism. Highlights: Clinic break-in; cable-car fight; meeting with Sir Miles. Using poisons and biological warfare, a sinister organisation is carrying out a series of murders aimed at British and Turkish personnel. When one of the victims is too close to home, James Bond is ordered to investigate. Above:: British 1st edition Hodder & Stoughton hardback (UK). The Coronet UK paperback used the same artwork. James Bond takes on a fanatic secret organisation whose objective is mass murder in the thrilling new novel from the brilliant Raymond Benson. Someone is poisoning British soldiers in Cyprus; the same killer has murdered a British intelligence agent in Athens. James Bond himself barely escapes with his life... But the secrets behind these and other deaths first start to come to light in Texas, where Bond goes in search of the assassin of M's friend and lover. Fearful of an international scandal that could engulf both his service and his country, he learns instead of the existence of the Decada, Held together by an archaic philosophy and their own bizarre rituals, the Decada's fanatics have stockpiled a terrifying range of poisons and are willing to use them to further their insane ambitions for power and revenge. Aided by beautiful, brave Greek intelligence agent Niki Mirakos, Bond puts himself into the firing line for a last-ditch attempt to stop the Decada before they unleash a horrifying weapon on their helpless prey. 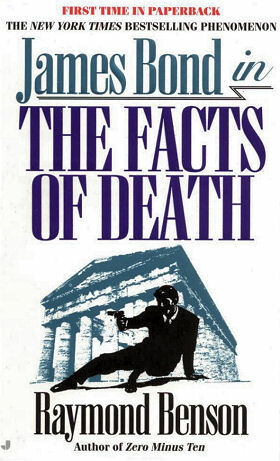 Packed with non-stop action and brilliant storytelling, The Facts Of Death is an unputdownable follow-up to Raymond Benson's scintillating debut as the chronicler of James Bond. Benson's 007 is a chip off the old block, said Kirkus Reviews of the classic secret agent depicted in Zero Minus Ten, Raymond Benson's first James Bond novel. Fast-paced, fun summer reading, wrote The Boston Sunday Herald. Bond is still as irresistible as ever. Now Benson takes Bond to the heart of a fanatical cult whose sinister mission is wrapped in the teachings of the great Greek mathematician Pythagoras. His cult is committed to following their brilliant and mad leader on a series of assignments, each one more diabolical and destructive than the last. When Alfred Hutchinson, Great Britain's Goodwill Ambassador to the World, is murdered by a stranger whose umbrella tip bears a tiny capsule of ricin poison and who leaves behind a scrawled #4, Bond is called upon to halt the escalating body count of the Number Killer. His hunt will take him from the wild backroads of Texas to the crumbling ruins of Greece, a trail that crisscrosses the potentially explosive tinderbox of Cyprus. At every step he must use both cunning and brute force to stay ahead of--or even with--the grand plan of the Monad, the shadowy mastermind behind the cult. Propelled by an extraordinary Jaguar XK8 coup designed for this mission, challenged by life-threatening underwater and aerial attacks, and seduced by a galaxy of beautiful and destructive women, James Bond is once again the archetype action hero--this time caught in a final countdown, where each heartbeat could be his last. They call him the Number Killer. A calculating assassin who always leaves a numerical calling card. But now he's picked the wrong victim - M's lover - and James Bond is going to beat the odds to make things even. Anderson: "So, this is goodbye, Mr Bond. Too bad. You really were an excellent donor candidate"
Right: American 1st edition Jove paperback. The woman began by lightly sliding the sharp point of the knife over Bond's face. She took her time, slowly moving it along the skin. Any more pressure and the knife would penetrate the outer layer of tissue. Bond kept perfectly still. She seems fascinated by his face, the way a young girl might gaze upon a new doll. She traced the nose and around the nostrils with the blade. She ran it along his lips and even placed it gently in his mouth and twisted it. Bond wondered how long it would take before she got rougher. 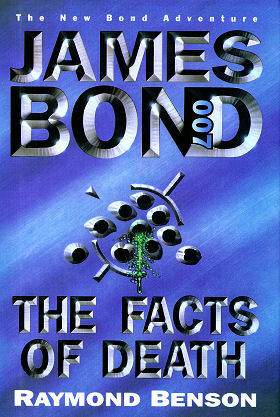 The title of the final chapter of "The Facts Of Death", Bond's family motto, would be used as the title for the next feature film "The World Is Not Enough" a year later in 1999. Disease-caused deaths are starting around the world. 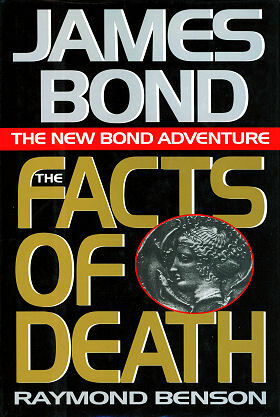 Meanwhile Bond is trying to catch up with the 'Number Killer', an assassin leaving statues of Greek Gods and numbers at each killing: No1 was MI5 agent Whitten in Athens; 2 and 3 were attacks on the British army in Cyprus; 4 was M's partner Alfred Hutchinson, Britain's ambassador to the world who died in bed with Bond's boss; Meanwhile on the Greek island of Chios the Decada, a group of Pythagoras followers, celebrate. Bond seeks out Hutchinson's son Charles in Texas and there teams up with Felix. The discover a link between the infertility clinic Charles worked for and a criminal group, The Suppliers, who provided the poison used to kill Alfred. Bond pulls the clinic's boss Dr Anderson and overpowers her as she blows up the clinic. She kills herself, and Bond and Felix raid the Suppliers and dismantle their organisation. Meanwhile killing no.5 occurs in a Turkish barracks and the Number Killer then sprays food with lethal gas. But Charles Hutchinson warns the authorities before being murdered for betraying the Decada. Bond arrives there to work with Niki Mirakos, the beautiful Greek agent he preciously slept with. They find Charles' body (victim 7) and Bond angers Romanos, the suspected Decada leader, at the casino which he leaves with beautiful redhead Hera Volopoulos who drugs him after they survive a fight with Decada henchmen. M digs up a letter from the Decada, previously considered a hoax, threatening to start war between Greece and Turkey. Bond escapes his execution but is recaptured and brought before Romanos who explains he wants war but knows nothing about the mysterious disease, now spreading around the world. Bond jumps overboard to escape, and he and Niki realise the next victim is the President of Northern Cyprus. Manville Duncan, Alfred's replacement will carry out the killing, but Bond arrives in time to shoot him. No10 will be the firing of a missile stolen by a Greek officer working for the Decada, but on Chios Bond and Niki track down the base, but Bond is caught. Romanos leaves Bond a puzzle and a chance to escape, but then Hera kills him and announces she is taking over the Decada. She and two other members planned the Williams' disease and released it through Charles Hutchinson. They know the antidote. Hera escapes, but Bond solves the puzzle and disarms the missile. He is picked up by a helicopter chasing the remaining Decada, including Hera. Bond's lot are shot down, but just before the pilot ditches safely in the sea Bond fires a handheld Stinger missile and shoots down the Decada. He drowns Hera who somehow survived the fireball and recovers the antidote from a briefcase. Publisher's Weekly - Led by a hypnotic, self-styled Greek demigod, the villainous Decada cabal prove insanely worthy adversaries for 007 as they plan chemical and biological revenge against Turkey (and any country they perceive as its allies) in the immortal SIS agent's new outing. Benson (Zero Minus Ten; The James Bond Bedside Companion) cues off the latest Bond reels by setting up his female "M" (head of SIS) with Alfred Hutchinson, a suspicious politico linked to the Decada. When he is murdered, Bond goes to Texas in search of Hutchinson's missing son, reunites with American agent Felix Leiter (now confined to a wheelchair), stumbles onto the source for the Decada's chemical and biological weapons and follows the trail back to Greece. Sexual subterfuge, ever Bond's betrayer and salvation, lands him in the clutches of Konstantine Romanos, mad leader of the Decada, and the result is several quintessential 007 escape/rescue scenes (aided by a luscious Greek agent) before the final showdown under a nuclear shadow on Cyprus. Edgar winner Benson pays homage to Fleming's plots in an amusing inventory of Bond's scars; touchingly ages Leiter, loyal Miss Moneypenny and long-suffering arms maven Boothroyd; and imbues his Bond with enough honor, sexual prowess and action-hero skills to please the purist and enthrall the novice.